Chicago’s Divvy bike-share vehicles won’t come with helmets. Last summer when I visited Copenhagen, I drank Carlsberg beer with Mikael Colville-Andersen, one of the world’s most influential and controversial bicycle advocates, in his lush back yard while his kids practiced soccer and picked flowers. Colville-Andersen heads the consulting firm Copenhagenize, advising politicians, planners and advocates on ways to copy the success of the bike-friendly Danish capital, but he’s probably better known for his wildly popular photo blog, Copenhagen Cycle Chic. Among the many topics we discussed was his attitude toward bike helmets. He thinks they’re totally unnecessary for urban commuting, and he believes that promoting helmet use is actually counterproductive for making cycling safer. In northern European bicycle meccas like Copenhagen and Amsterdam, more than a third of all trips are made by bike, almost nobody wears a helmet, and yet injury rates are much lower than in the United States, where lots of people wear helmets. One reason crashes are relatively rare in these cities is the safety-in-numbers factor. There are so many cyclists in these places that drivers are always looking out for them, and wouldn’t dream of making a right turn or opening a car door without first checking that the coast is clear. And part of the reason there are so many people on bikes is because cycling feels so safe that strapping a Styrofoam and plastic shell on your head really does seem superfluous. It’s easy for Colville-Andersen to say that helmets are unnecessary when he lives in a pedaler’s paradise. Copenhagen cyclists never have to share the road with high-speed traffic. Virtually all major streets have raised bicycle lanes, elevated a few inches above the roadway, and neighborhood streets are designed so that cars must travel at a mellow speed. Things are different here in Chicago and other North American cities where biking is relatively rare and fast, reckless, distracted and/or drunk driving is common. Ask Dustin Valenta, who was doored by one motorist in Wicker Park last February, then run over by a second who fled the scene. Miraculously, he survived, but he suffered a cracked skull and vertebrae, broken shoulder blades and pelvis, twenty-three fractured ribs and a punctured lung. Or talk to Justin Carver, who’s making an amazing recovery from serious brain damage, after being “left-hooked” in Berwyn last December by a teenage driver who tested positive for marijuana. Their cases are a sobering reminder that even if you’re doing everything right on a bike, you could be the victim of someone else’s dangerous behavior, suggesting that it’s a good idea to wear a helmet while biking Chicago-area streets. While helmets may help reduce the damage done by crashes, they don’t prevent them, which is why the Chicago Department of Transportation’s current push to build dozens of miles of car-protected bike lanes by 2015 is so crucial. Since these facilities are sheltered from moving traffic by lines of parked cars, they reduce the chances that reckless drivers will careen into people on bikes, and they can help make more people feel comfortable riding on city streets. That in turn will boost the safety-in-numbers factor. 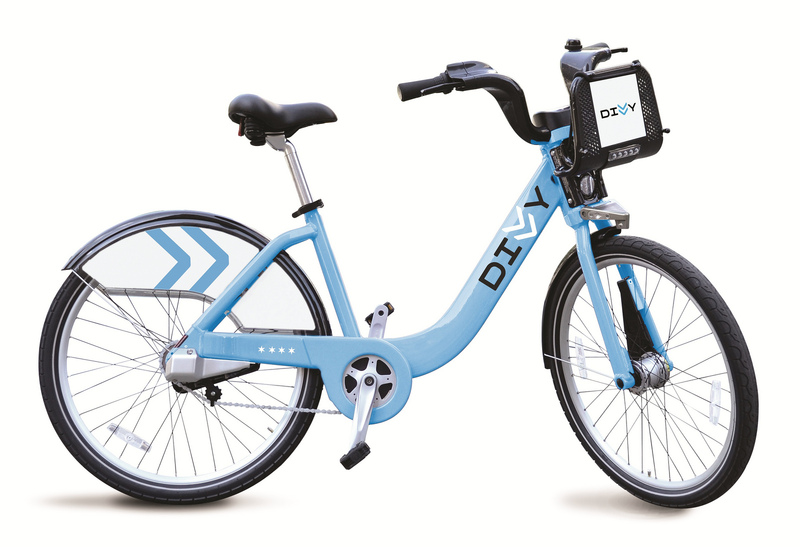 Another initiative that promises to dramatically increase the amount of cycling here is the 4,000-vehicle Divvy bike-share system, slated to launch in June. As the prominent DIY in the logo suggests, the system is designed to be do-it-yourself public transportation, with clunky-but-comfy cycles you can check out at automated docking stations, intended for trips of thirty minutes or less. Bike-share now exists in 500 cities worldwide, and it has caused major spikes in cycling in places like Barcelona, Spain, where the mode share more than doubled shortly after the Bicing system debuted in 2007. Such has been the case in Washington, D.C., where current CDOT Commissioner Gabe Klein launched Capital Bikeshare, America’s largest system with more than 1,800 vehicles, before joining the Emanuel administration. I had a blast using the bikes when I visited my family in the District last February. However, my sister-in-law Nell, a science reporter, said she’s horrified that so many new people are now riding in her city without helmets, since there’s no practical, hygienic way to provide them with the bikes. CDOT doesn’t seem too fazed by this issue. “We’ll encourage folks to use their own helmets, if they think they’ll need them,” spokesman Pete Scales recently told the Tribune. Fact is, most people aren’t going to wear helmets when using Divvy, but maybe that isn’t a big problem. The Chicago-flag-blue cycles are very stable, heavy, upright steeds meant for short trips and errands, a much-less-risky style of riding than zooming down Milwaukee on a brakeless fixie. I’m confident that the Divvy launch will be a tipping point for Chicago cycling. It’s very possible that our city’s bike mode share, currently less than two percent, will double or triple in the near future, putting us on par with Portland. When you combine the safety-in-numbers factor with many miles of new protected lanes, hopefully it won’t be long before bike helmets become truly obsolete here.